These home-made crunchy chicken pieces are guaranteed to be a winner with children of all ages and, as they are baked in the oven, they are lower in fat. They can be prepared ahead of time, kept in the fridge, then cooked just before needed. They are at their best when still warm from the oven. Preheat the oven to 190°C, gas mark 5. Line a large baking tray with baking parchment. Place the bread in a blender or food processor and blend to make fine breadcrumbs. Mix the breadcrumbs with the grated cheese and tip onto a large plate. Place the egg whites and flour in 2 separate, shallow bowls. Dip the chicken pieces in the flour first to lightly dust, then dip into the egg whites and finally into the cheesy breadcrumbs, turning to evenly coat. Place on the prepared baking tray. Bake in the oven for 25-30 minutes, until the chicken is thoroughly cooked, there is no pink meat and the juices run clear when pierced with a sharp knife. 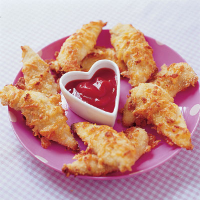 Serve the chicken dippers with Peter Rabbit Organic Tomato Ketchup or mayonnaise.